The world’s number one rated race horse Winx will line against seven rivals in the 2018 Group 1 $5m Ladbrokes Cox Plate (2040m) at The Valley on Saturday. Winx, above, has drawn barrier 6 in the 2018 Cox Plate at The Valley. Photo by Steve Hart,. Winx is lining up for her fourth consecutive Cox Plate win and regular rider Hugh Bowman will be able to give the champion mare every opportunity to re-write the history books from barrier six in the eight horse field. 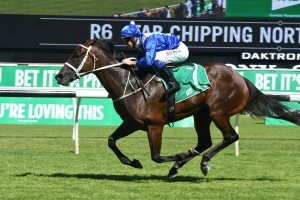 Winx equalled the legendary Kingston Town’s three straight Cox Plate victories last year and the Chris Waller trained mare will make in twenty-nine wins in succession if she can collect the winning Cox Plate trophy again this year. Waller took Winx to The Valley this morning for her final solid hit out before Saturday’s test and reported that both horse and jockey came through the work in great style.